A landslide is closing a state road near the Hawkins/Hancock County line for the remainder of the week. 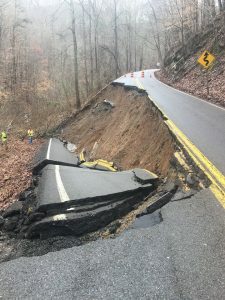 The Tennessee Department of Transportation says on State Route 66, the slide occurred on February 7th with heavy rains affecting the area last week. Crews are on scene clearing loose material and will construct a rock buttress that to replace the lost roadway. TDOT will perform the repair and the road will be closed, with hopes to reopen the road at the end of this week.